If you notice that your complexion is not as bright or radiant as it once was, chemical peels are a great way to achieve healthy, glowing skin. At Forever Young Med Spa in Archdale, North Carolina, the team offers chemical peels to men and women searching for better skin tone and a clearer complexion. Forever Young also commonly serves people from Thomasville, Asheboro, and High Point, as well as people from Randolph, Davidson, and Guilford County. If you have questions about this effective yet minimally invasive cosmetic treatment option, call the office to book an appointment, or use the simple online scheduling tool. Your body naturally sheds dead skin cells over time, but that turnover slows as you age. A chemical peel is a powerful exfoliation technique that should only be performed by a professional with advanced skills and training, as it essentially removes the outermost layer of your skin and reveals the healthy skin cells that lie beneath. The word “chemical” has numerous negative associations, and many people hear the term “chemical peel” and envision a dangerous and potentially harmful procedure. In reality, the solutions used in this innovative skincare treatment are carefully formulated to deliver highly effective results without harming your skin. What skin conditions can chemical peels improve? Before your peel, the Forever Young team reviews your medical history and checks your skin to determine if the treatment is appropriate. During your appointment, the doctor carefully cleanses your skin before applying the chemical peel formula. The length of time the peel is left on your skin depends on the type of peel you’re getting and your skin’s condition. Once the peel is complete, your Forever Young provider gently removes the peel and cleans your skin again. A calming lotion or antibiotic cream may then be applied to soothe and protect your skin. After the peel, your skin may be red and swollen. As your body heals, you may experience skin crusts or even blisters on some portions of the treated area. Your Forever Young provider will advise you on how to properly care for your skin as the healing process moves forward. 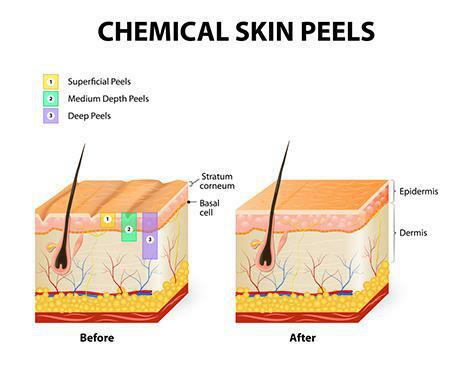 Once healing is complete, the effects of your chemical peel will become apparent. By following your post-treatment instructions and taking good care of your skin, you can increase the lifespan of your results. How long do chemical peel results last? Your results will be unique and depend on the condition of your skin before the peel, as well as how closely you follow the instructions provided during your appointment. To begin your path toward radiant, beautiful skin, schedule an appointment at Forever Young Med Spa today.